Bhopal is the capital of Madhya Pradesh. That means today we are going to talk about central India. The state has inspired many Mughal kings to settle here because of its centralised locations, resulting in creating the state in a living heritage site. The city of Bhopal is magnificently crafted with beautiful lakes adding tones to its landscape. It is interesting to note how the design element and aesthetic sense was high during the times of the Mughals. So today, stunned by the beauty of this place, we have decided to put together a number of things that you can do if you have only 24 hours to spend in the city. So let's go. What's the point of not exploring the lakes if you have come all the way to a state that is known for its lakes? Yes, if you don't know that already, its capital is known as the city of lakes. You can see how beautifully the Mughal architects have constructed a city that has stood the test of time and is still functioning. The beautiful city of Bhopal has many lakes to explore but our favourite is Bhojtal - probably the most famous one... There is a reason that the lake is so famous. The marvellous lake gives spectacular sunsets and beautiful pictures. The lake area has been commercialised due to its popularity. Even the locals come here to take a break from their everyday life and celebrate a moment of peace with this quiet lake. There are vendors around the lake and you'll see tiny boats paddling their way in the lake. The white swans will grab your attention as you scale the entire lake here. In the evening, the entire lake is lit up and you'll see a big sign that says, "WELCOME TO THE CITY OF LAKES". After lakes, it's the buildings and age-old architecture that Madhya Pradesh is known for. It is a history buffs' paradise. These buildings tell their own story and it is fascinating to see how, once, these buildings used to be so alive and now serve as a mere showpiece of history. Gohar Mahal is an age-old building. As compared to other palaces, the building's architecture looks mellow. The pink buildings and domes are beautifully constructed but do not lure other people who are looking for marvellously carved out buildings. The building has its historical significance. It was built by the first queen Qudsia Begum of Bhopal around 1860. The place now serves as an exhibition ground. But it is still worth a visit just to remember the brave queen. This national park is one of the most popular plants in central India. 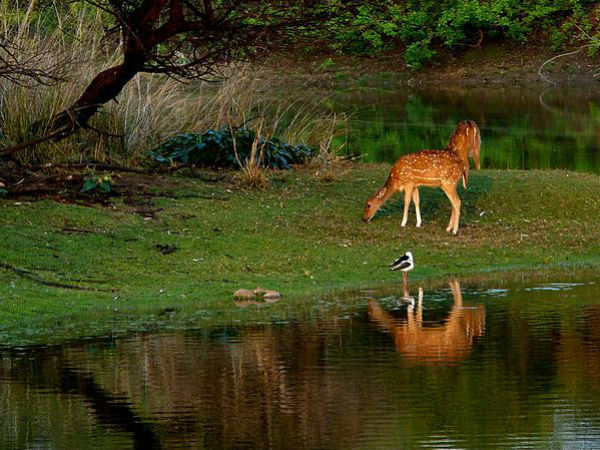 This park is a haven for wildlife lovers and nature photographers as it has so much to offer. The park is housed between the two lakes in the city and gets the attention of the local crowd as well as the tourists. You can spot some beautiful animals in this national park. The park is spread over the area of 445 acres so you can sense how big of a stroll that can be. The park is well kept over the years and the animals look quite happy. You can spot colourful birds, tigers, deer, leopards, panthers and lions. It'll make for a great trip if you bring your children. Another age-old architectural marvel is the Bhojpur Temple. The temple was built in the 11th century and still smiles brilliantly at its visitors. The Shiv idol in the temple is known to be the largest rock structure in the world - standing at a height of 21 feet. As you explore the temple, you'll come across beautifully carved out walls featuring Hindu god and goddesses. The drawings have been studied by archaeologists and it has been found that the temple was left incomplete. Another site that you must not miss is Lakshmi Narayan Temple. Not because of the religious reason but the build of the temple. It is said that a trip to Bhopal is incomplete without a visit to Lakshmi Narayan Mandir. The view from the temple is breathtaking. It is surrounded by lakes and gives a beautiful view of a landscape. Even if you have no idea about the architectural elements, you can still admire the archway and wooden cenotaphs. It is a beautiful temple. It has been kept and taken care of. Don't miss the aarti. It is housed on the shores of Motia Talab. Another property that is beautified by the presence of a lake... This city has no shortage of lakes. The Mughals thought everything through while constructing it. The mosque is a tourist attraction and lures many visitors into it. It is known as the Crown of the Mosques as it is one of the largest mosques in India, accommodating about 175000 people. Its marvellous architect and spectacular design can fascinate any architect looking to study age-old buildings.